Hello all! 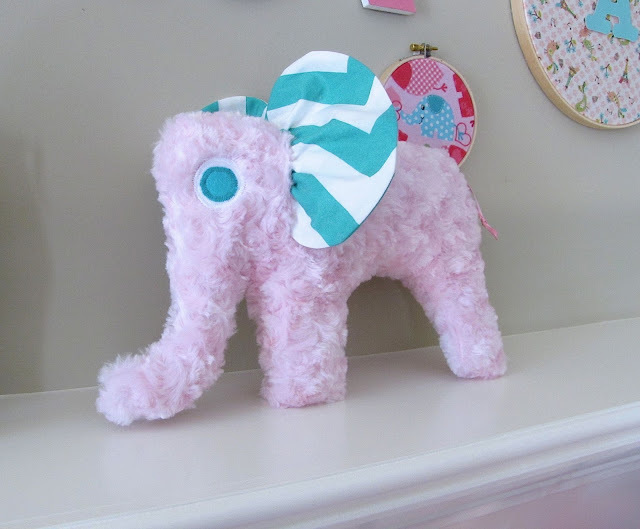 Today I'm going to show you how to make a stuffed elephant. 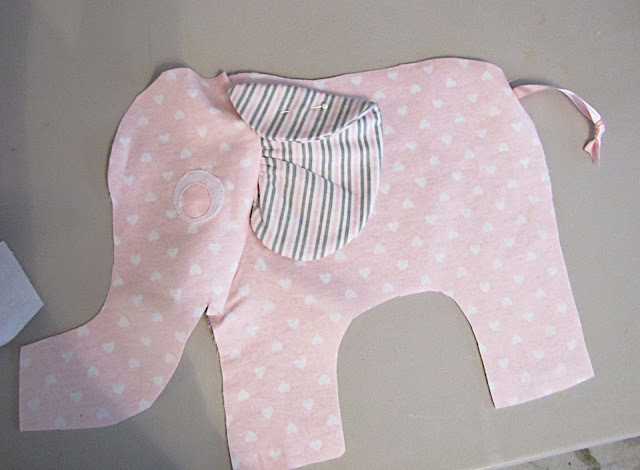 I used them as decorations at my sisters elephant baby shower. 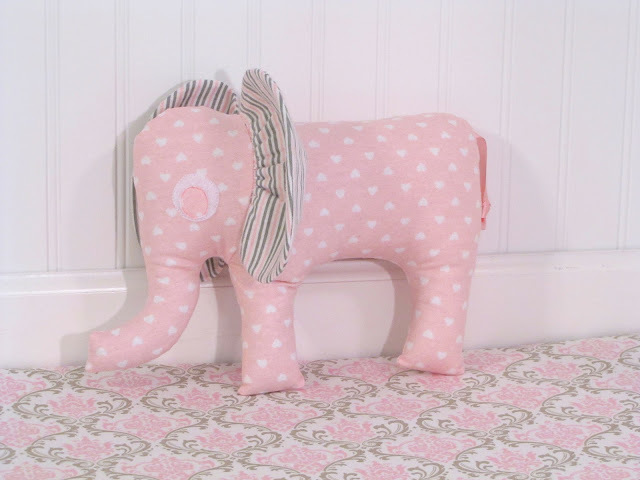 The theme for her nursery was elephants so she was able to use these as well as the rest of the shower decor in the baby's room. Don't you love it when items work double duty! I found the pattern at Riley Blake Designs. It was created by Jess at Craftiness is Not Optional. She's so talented! Read on to see how to make your own. 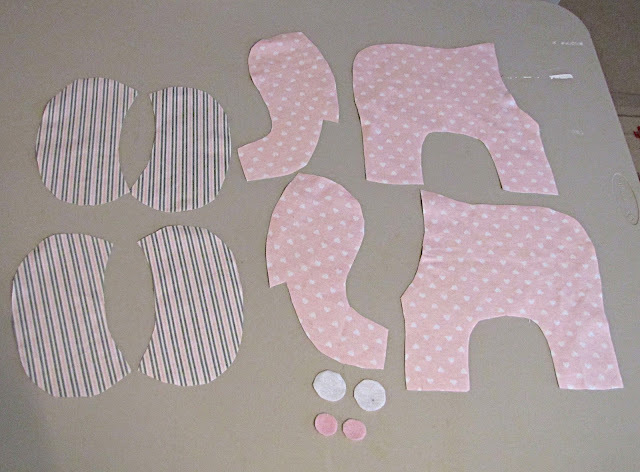 First, using the pattern I cut out all the pieces. Take each of the ear pieces and match them up one on top of the other with right sides together and pin in place. Sew them together at 1/4" seam allowance along the outside edges, leaving the inside curve open for turning. Trim the seams, turn right side out and iron them flat. 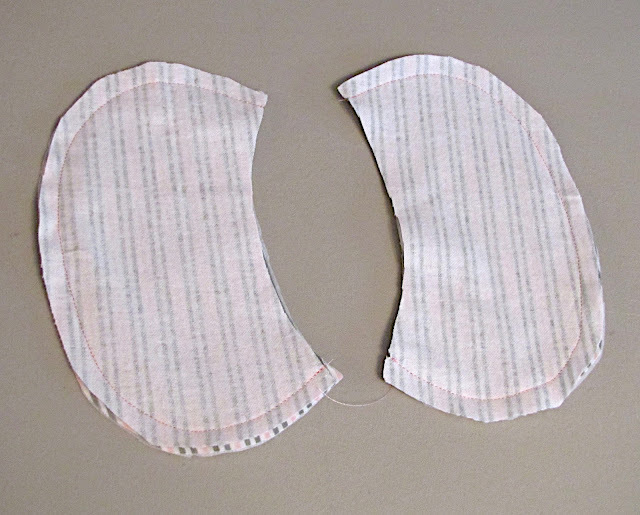 Using a basting stitch (the longest stitch length) sew along the curved inside edges of each ear. Pull one of the threads at the end to gather the fabric. 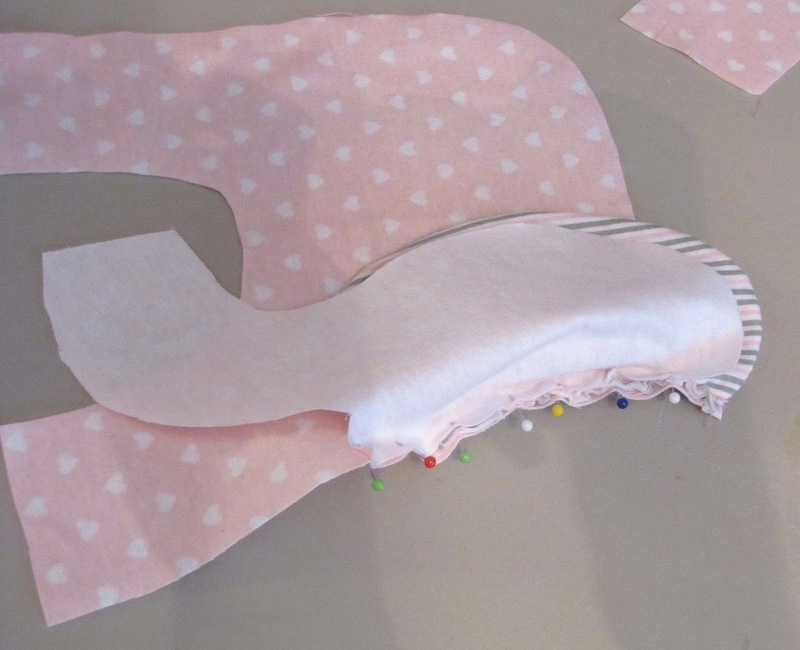 Once you've gathered them sew along the top of the basting stitch with a regular stitch to secure it in place. 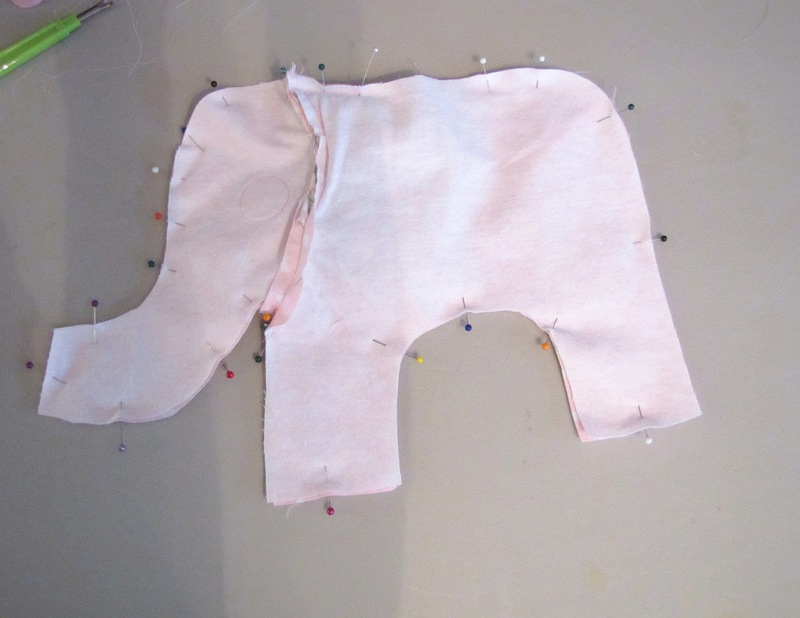 Line the ear up with the edge of the elephants neck making sure to leave half an inch at the top for the back seam. Sew in place. Do these next few steps to both sides of the elephants body. 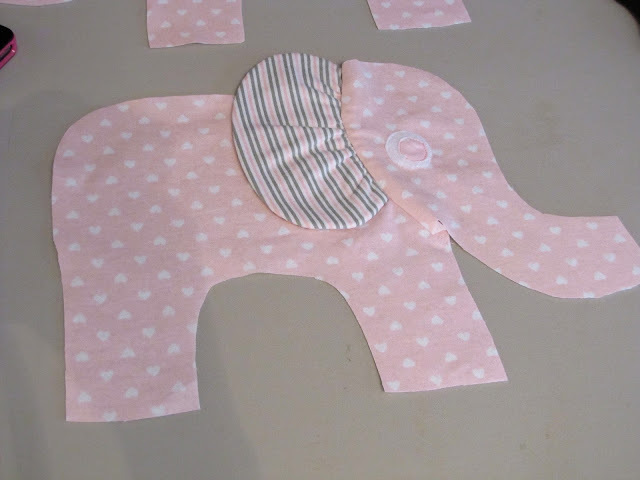 Next, line up the head piece with the edge of the elephants body. With right sides facing, pin and sew in place. Iron the pieces so they are nice and flat. 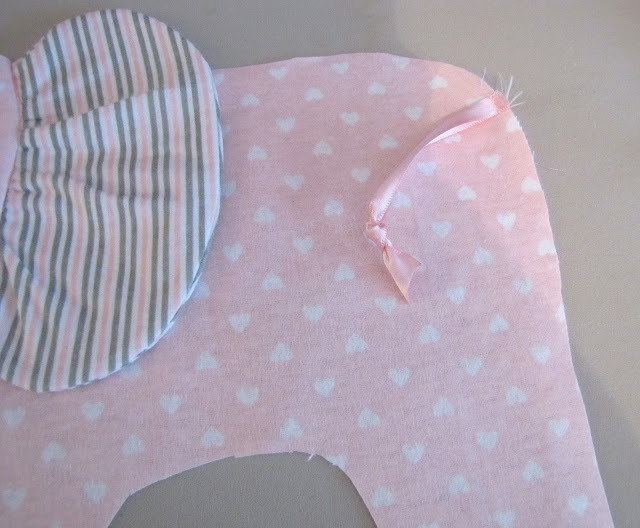 Sew the felt eyes onto the head piece. Cut your ribbon tail to the size you want and tie a knot in the end. Mine was about 3". 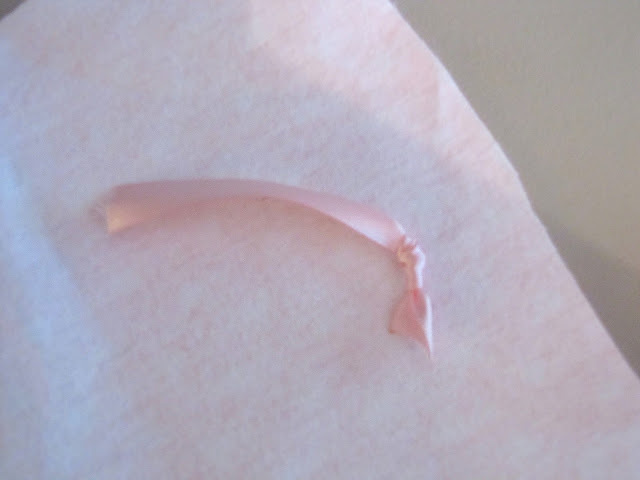 I melted the edge of the ribbon with a lighter to keep it from fraying. 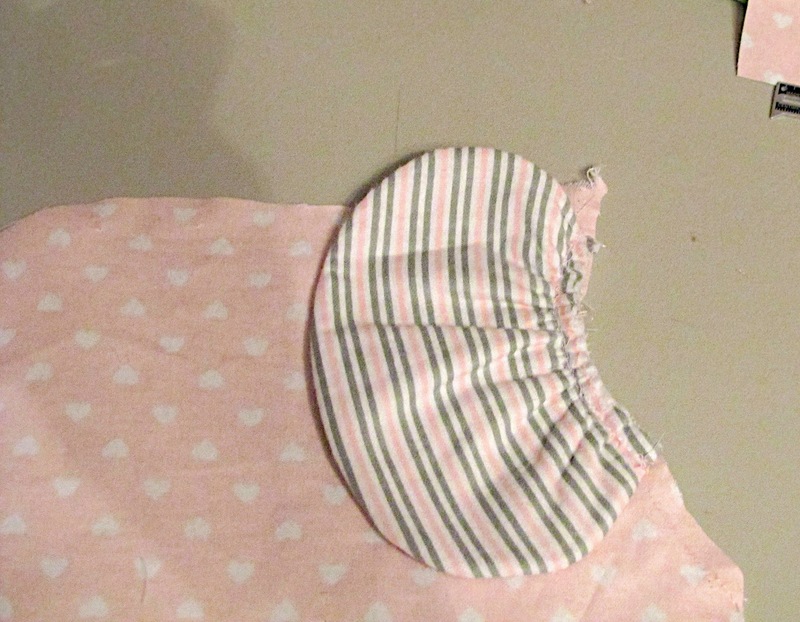 Pin in place and sew it so the tail is facing the inside like this. 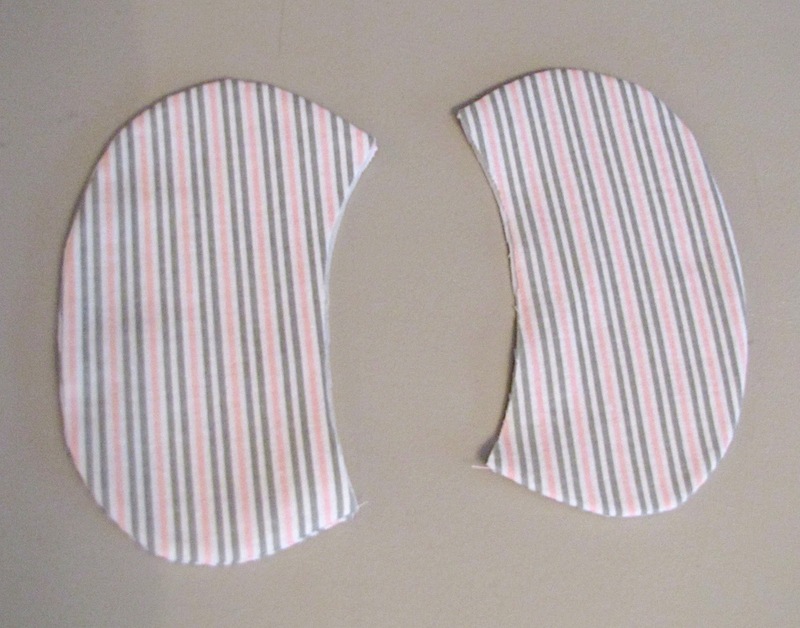 I pinned the ears down to keep them out of the way while I sewed the two body pieces together. 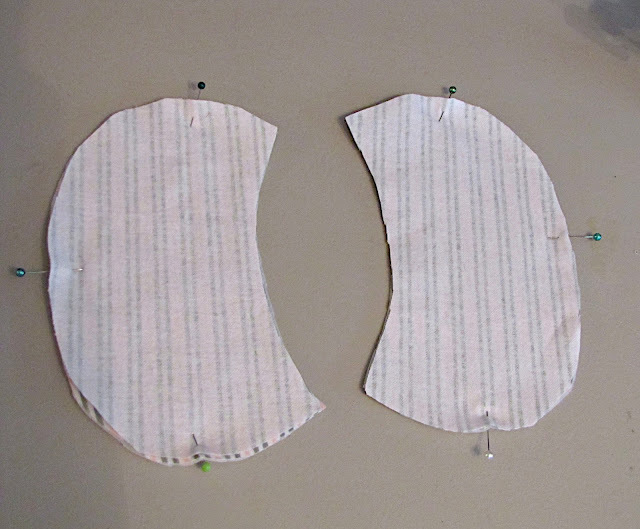 Line up each of the body pieces with right sides facing and pin in place. 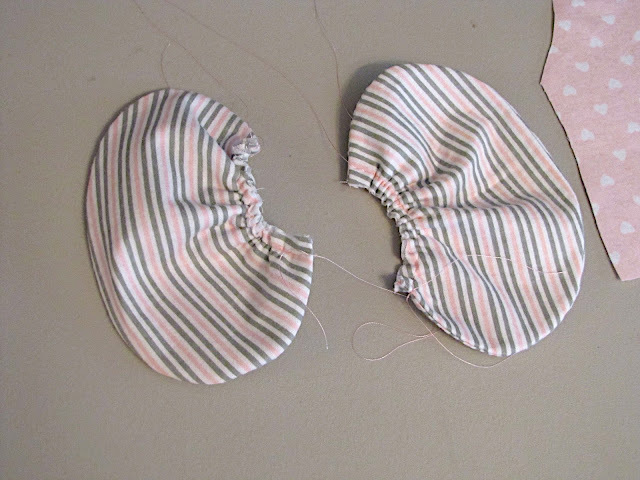 You're going to sew them together along the edges leaving a three inch opening on the top for turning. Clip the seams and turn right side out. Stuff your elephant with polyfil and hand stitch the opening closed. Voila! 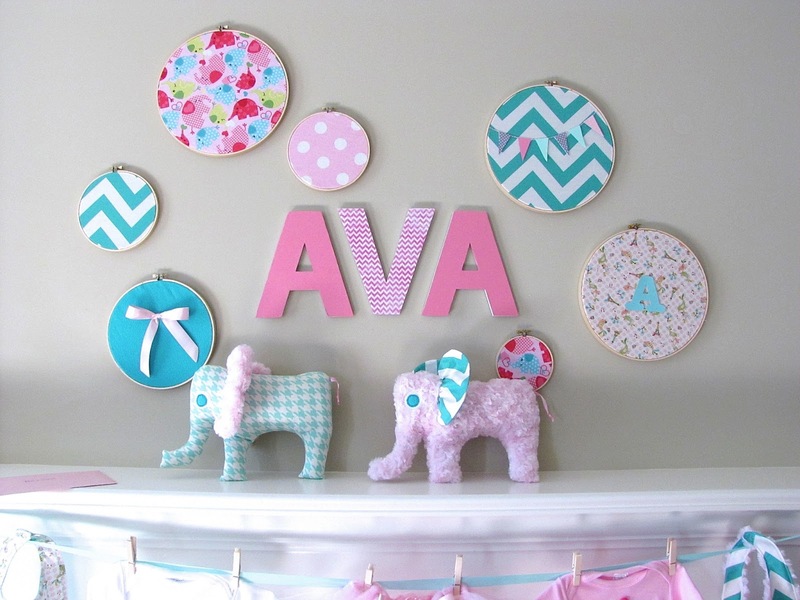 Super cute little gift in just a few easy steps! Don't you just love those floppy ears? 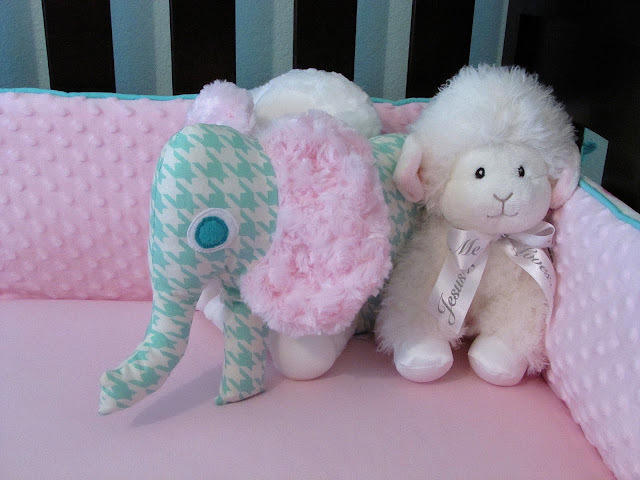 Make sure to check out her elephant baby shower and pink and aqua elephant nursery for more inspiration! The pattern is not coming up for me. Hey Linda! I just tried it again and it worked for me. Here is a link to the post of the girl who wrote the guest post for Riley Blake designs. The link is in her post also. Maybe try that one and see if you can get it to work. http://www.craftinessisnotoptional.com/2011/11/guest-post-for-riley-blake.html Also sometimes when I can't get documents to come up I try a different browser. Hope that helps!